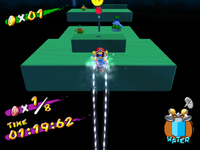 Red Coin Chucksters is the bonus ninth episode of Pianta Village in Super Mario Sunshine. It can be accessed by replaying Secret of the Village Underside. High in the air above the second Chuckster. In the third Chuckster's path. Two are on the platform with the Strollin' Stus. Above the tightrope behind the platform with the Strollin' Stus. On the platform with the flaming Pianta. The final two are on the platform with the circling Chuckster. This page was last edited on June 10, 2017, at 17:33.